1 1. Have the Weather Honor. 2 2. Explain cyclonic and anticyclonic weather conditions and know how they bring about weather changes. 3 3. What are cold fronts and warm fronts? How do they move and what weather con­ditions do they produce? 5 5. Explain the action of a registering thermometer, registering barograph, hygrometer, and an anemometer. 6 6. Correctly read a daily weather map as published by the National Weather Service, explaining the symbols and telling how predictions are made. 7 7. What is meant by relative humidity and dew-point? 8 8. Draw a cross section of the atmosphere, showing its five layers and describe them. 9.6 g. Weather forecasts and comparison to what really happened. 10 10. Discuss the effect of mankind on weather. 1. Have the Weather Honor. Instructions and tips for earning the Weather honor can be found in the Nature chapter. 2. Explain cyclonic and anticyclonic weather conditions and know how they bring about weather changes. Extratropical cyclones can bring mild weather with a little rain and surface winds of 15–30 km/h (10–20 mph), or they can be cold and dangerous with torrential rain and winds exceeding 119 km/h (74 mph), (sometimes referred to as windstorms in Europe). The band of precipitation that is associated with the warm front is often extensive. In mature extratropical cyclones, an area known as the comma head on the northwest periphery of the surface low can be a region of heavy precipitation, frequent thunderstorms, and thundersnows. Cyclones tend to move along a predictable path at a moderate rate of progress. During fall, winter, and spring, the atmosphere over continents can be cold enough through the depth of the troposphere to cause snowfall. An anticyclonic storm is a weather storm where winds around the storm flow contrary to the direction dictated by the Coriolis effect about a region of low pressure. In the northern hemisphere, anticyclonic storms involve clockwise wind flow; in the southern hemisphere, they involve counterclockwise wind flow. Anticyclonic storms usually form around high-pressure systems. These do not "contradict" the Coriolis effect; it predicts such anticyclonic flow about high-pressure regions. Anticyclonic storms, as high-pressure systems, usually accompany cold weather and are frequently a factor in large snowstorms. Anticyclonic tornadoes often occur; while tornadoes' vortices are low-pressure regions, this occurs because tornadoes occur on a small enough scale such that the Coriolis effect is negligible. 3. What are cold fronts and warm fronts? How do they move and what weather con­ditions do they produce? The symbol of a cold front: a blue line with triangles pointing in the direction of travel. A cold front is defined as the leading edge of a cooler and drier mass of air. The air with greater density wedges under the less dense warmer air, lifting it, which can cause the formation a narrow line of showers and thunderstorms when enough moisture is present. This upward motion causes lowered pressure along the cold front. On weather maps, the surface position of the cold front is marked with the symbol of a blue line of triangles/spikes (pips) pointing in the direction of travel. Cold fronts can move up to twice as fast as warm fronts, and produce sharper changes in weather than warm fronts, since cold air is denser than warm air it rapidly replaces the warm air preceding the boundary. Cold fronts are typically accompanied by a narrow band of showers and thunderstorms. Cold fronts are usually associated with an area of low pressure, and sometimes, a warm front. The symbol of a cold front: a line with red semicircles pointing in the direction of the advancement of the front. A warm front is defined as the leading edge of a mass of warm air. Warm fronts move more slowly than the cold front which usually follows due to the fact that cold air is more dense, and harder to remove from the Earth's surface. If the warm air mass is stable, clouds ahead of the warm front are mostly stratiform and rainfall gradually increases as the front approaches. At the front itself, the clouds can reach the surface as fog. Clearing and warming is usually rapid after frontal passage. If the warm air mass is unstable, thunderstorms may be embedded among the stratiform clouds ahead of the front, and after frontal passage, thundershowers may continue. In the northern hemisphere a warm front usually causes a shift of wind from southeast to southwest and in the southern hemisphere from northeast to northwest. 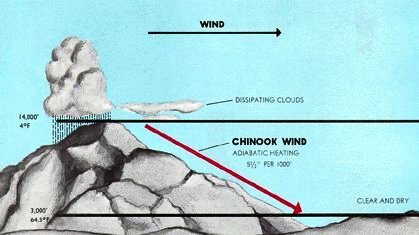 Chinook winds, often just called chinooks, are winds in the interior West of North America, where the Canadian Prairies and Great Plains meet various mountain ranges. Southeast of the mountains, on the British Columbia Coast and in the Puget Sound area, it is a warm, very wet, southwesterly wind, likely to bring rain or snow. Northeast of the mountains, it is warm and dry, after being stripped of its moisture by the mountains in its path. The trade winds are a pattern of wind that are found in bands around the Earth's equatorial region. The trade winds are the prevailing winds in the tropics, blowing from the high-pressure area in the horse latitudes towards the low-pressure area around the equator. The trade winds blow predominantly from the northeast in the northern hemisphere and from the southeast in the southern hemisphere. The thunderstorms of the Intertropical Convergence Zone form a line across the eastern Pacific Ocean. The Belt of Calms is more properly known as the Intertropical Convergence Zone (ITCZ). It is also known as the Intertropical Front, Monsoon trough, Doldrums or the Equatorial Convergence Zone, is a belt of low pressure girdling Earth at the equator. It is formed by the vertical ascent of warm, moist air from the latitudes above and below the equator. Position of the ITCZ in July (red) and in January (blue). The air is drawn into the intertropical convergence zone by the action of the Hadley cell, a macroscale atmospheric feature which is part of the Earth's heat and moisture distribution system. It is transported aloft by the convective activity of thunderstorms; regions in the intertropical convergence zone receive precipitation more than 200 days in a year. The location of the intertropical convergence zone varies over time. Over land, it moves back and forth across the equator following the sun's zenith point. Over the oceans, where the convergence zone is better defined, the seasonal cycle is more subtle, as the convection is constrained by the distribution of ocean temperatures. Sometimes, a double ITCZ forms, with one located north and another south of the equator. When this occurs, a narrow ridge of high pressure forms between the two convergence zones, one of which is usually stronger than the other. Variation in the location of the intertropical convergence zone drastically affects rainfall in many equatorial nations, resulting in the wet and dry seasons of the tropics rather than the cold and warm seasons of higher latitudes. Longer term changes in the intertropical convergence zone can result in severe droughts or flooding in nearby areas. Within the ITCZ the average winds are slight, unlike the zones north and south of the equator where the trade winds feed in. Early sailors named this belt of calm the doldrums because of the inactivity and stagnation they found themselves in after days of no wind. To find oneself becalmed in this region in a hot and muggy climate could mean death in an era when wind was the force to propel ships across the ocean. A tornado is a violently rotating column of air which is in contact with both a cumulonimbus cloud or, in rare cases, a cumulus cloud base and the surface of the earth. Tornadoes come in many sizes but are typically in the form of a visible condensation funnel, whose narrow end touches the earth and is often encircled by a cloud of debris. Most tornadoes have wind speeds of 177 km/h or less, are approximately 75 meters across, and travel several kilometers before dissipating. Some attain wind speeds of more than 480 km/h , stretch more than 1.6 kilometers across, and stay on the ground for more than 100km . Although tornadoes have been observed on every continent except Antarctica, most occur in the United States. Typical evolution of thunderstorms (a) into a bow echo (b, c) and into a comma echo (d). Dashed line indicates axis of greatest potential for downbursts. Arrows indicate wind flow relative to the storm. Area C is most prone to supporting tornado development. A squall line is a line of severe thunderstorms that can form along or ahead of a cold front. In the early 20th century, the term was used as a synonym for cold front. It contains heavy precipitation, hail, frequent lightning, strong straight line winds, and possibly tornadoes and waterspouts. Severe weather along squall lines can be expected if it displays a line echo wave pattern (LEWP) or if the line is in the shape of a bow echo. The best indication of the presence of severe weather along a squall line is its morphing into a line echo wave pattern, or LEWP. A LEWP is a special configuration in a line of convective storms that indicates the presence of a low pressure area and the possibility of damaging winds, large hail, and tornadoes. At each kink along the LEWP is a mesoscale low pressure area. In response to very strong outflow southwest of the mesoscale low, an equatorward portion of the line bulges outward forming a bow echo. Behind this bulge lies the mesoscale high pressure area. A typhoon is a tropical cyclone that originates in the Western Pacific Ocean, and having winds in excess of 118 km/h . A tropical cyclone is a meteorological term for a storm system characterized by a low pressure system center and thunderstorms that produces strong wind and flooding rain. A tropical cyclone feeds on the heat released when moist air rises and the water vapor it contains condenses. They are fueled by a different heat mechanism than other cyclonic windstorms such as nor'easters, European windstorms, and polar lows, leading to their classification as "warm core" storm systems. The adjective "tropical" refers to both the geographic origin of these systems, which form almost exclusively in tropical regions of the globe, and their formation in Maritime Tropical air masses. The noun "cyclone" refers to such storms' cyclonic nature, with counterclockwise rotation in the Northern Hemisphere and clockwise rotation in the Southern Hemisphere. Depending on their location and strength, tropical cyclones are referred to by various other names, such as hurricane, typhoon, tropical storm, cyclonic storm, and tropical depression. While tropical cyclones can produce extremely powerful winds and torrential rain, they are also able to produce high waves and damaging storm surge. They develop over large bodies of warm water, and lose their strength if they move over land. This is the reason coastal regions can receive significant damage from a tropical cyclone, while inland regions are relatively safe from receiving strong winds. Heavy rains, however, can produce significant flooding inland, and storm surges can produce extensive coastal flooding up to 40 km from the coastline. Although their effects on human populations can be devastating, tropical cyclones can also relieve drought conditions. They also carry heat and energy away from the tropics and transport it towards temperate latitudes, which makes them an important part of the global atmospheric circulation mechanism. As a result, tropical cyclones help to maintain equilibrium in the Earth's troposphere, and to maintain a relatively stable and warm temperature worldwide. Many tropical cyclones develop when the atmospheric conditions around a weak disturbance in the atmosphere are favorable. Others form when other types of cyclones acquire tropical characteristics. Tropical systems are then moved by steering winds in the troposphere; if the conditions remain favorable, the tropical disturbance intensifies, and can even develop an eye. On the other end of the spectrum, if the conditions around the system deteriorate or the tropical cyclone makes landfall, the system weakens and eventually dissipates. A hurricane is a tropical cyclone originating in the Atlantic Ocean and having winds in excess of 118km/h . See the discussion above on Typhoons for more details on tropical cyclones. Locomptive stuck in the snow, March 29, 1881 in western Minnesota, not far from DeSmet. A blizzard is a severe winter storm condition characterized by low temperatures, strong winds, and heavy blowing snow. Blizzards are formed when a high pressure system, also known as a ridge, interacts with a low pressure system; this results in the advection of air from the high pressure zone into the low pressure area. The term blizzard is sometimes misused by news media to describe a large winter storm that does not actually satisfy official blizzard criteria. Because the factors involved with the classification of winter storms are complex, there are many different definitions of the word blizzard. A major consensus is that in order to be classified as a blizzard, as opposed to merely a winter storm, the weather must meet several conditions: There must be falling or blowing snow, strong winds, and cold or falling temperatures. What the measurements must amount to for a blizzard to be classified as such depends on where you are. The winter of 1880–81, was referred to in the Dakotas for many years afterward as the "Hard Winter". Author Laura Ingalls Wilder devoted her book The Long Winter to the telling of that winter's story, a narrative of one successive blizzard after another, and the effects on her family and those around her. The book is only slightly fictionalized, as far as her descriptions of the weather. Her tale of two men from the town of DeSmet, South Dakota going after some wheat rumored to be stored some miles south of DeSmet in February 1881 is true (Ingalls later married one of the men, Almanzo Wilder). It was speculated at the time that if the two men had not found and brought back the wheat, the residents would have starved before the eventual thaw in April 1881 which allowed the railroads to resume service. The snowbound locomotive pictured above was photographed on March 29, 1881 in western Minnesota, not far from DeSmet. An ice storm is a type of winter storm characterized by freezing rain. When rain falls onto freezing-cold ground, conditions can become dangerous. The cold rain freezes as it touches the ground and other surfaces. This freezing rain covers everything with heavy, smooth ice. The ice-covered roads become slippery and dangerous. Driving becomes extremely hazardous as the ice causes most vehicles to skid out of control, which can cause devastating car crashes as well as pile ups. Even pedestrians are severely affected as sidewalks become slippery, which can cause people to slip and fall and outside stairs can become an extreme injury hazard. In addition to hazardous driving/walking conditions, branches or even whole trees may break from the weight of ice. Falling branches can block roads, tear down power and telephone lines and cause other damage. Even without overhead tree branches, the weight of the ice itself can snap power lines, and power poles as well (even the big steel frame electrical pylons have crumbled under the weight of ice before). This can leave people without power for as long as several days to even weeks. According to most meteorologists, just one quarter of an inch of ice accumulation can add about 500 pounds of weight per line span. Damage from ice storms is highly capable of shutting down entire metropolitan areas. 5. Explain the action of a registering thermometer, registering barograph, hygrometer, and an anemometer. A Maximum Minimum thermometer, also known as Six’s thermometer after its inventor. The scales are Fahrenheit on the inside of the U and Celsius on the outside. The current temperature is 23 degrees Celsius, The maximum recorded is 25, and the minimum is 15, both read from the base of the small markers in each arm of the U tube. The bulbs are hidden by a plastic housing. A registering thermometer is a thermometer which can measure the maximum and minimum temperature during a given time. It is also known as a Maximum minimum thermometer. It is still in common use wherever a simple way is needed to measure the extremes of temperature at a location. There are many ways to construct a registering thermometer. Electronic thermometers can simply record the extremes digitally in a computer memory. However these were not commonly available in times past, so scientists had to come up with mechanical means of building registering thermometers. One such method, described below, was devised by James Six. Six's thermometer consists of a U-shaped capillary tube with two separate temperature readings, one for the maximum temperature and one for the minimum temperature. There are bulbs at the top of each arm of the U-shaped tube. The one at the top of the minimum reading scale contains alcohol, the other contains a vacuum or low pressure alcohol vapor. In the bend of the U is a section of mercury which is pushed around the tube by the expansion and contraction of the alcohol in the first bulb. It is the alcohol which measures the temperature, the mercury indicates the temperature reading on both scales. At any given time the position of the mercury should be the same on both the maximum and minimum scales. If not then the instrument scales are not correctly positioned. As the mercury moves it pushes two small steel markers which are sprung into the tube. They record the furthest point reached by the mercury in each arm of the tube. When the temperature reverses and the mercury is moved in the opposite direction by the expansion or contraction of the alcohol, the sprung markers remain in the tube at the furthest position they have been pushed by the mercury. They thus record the extremes of temperature experienced by the device since it was last reset. The markers are reset by using a small magnet which can drag the markers along the tube so that they again rest on the surface of the mercury. In some designs the tube is horizontal and the markers un-sprung so the device is reset by turning it to the vertical so that gravity returns the markers to the mercury. Its important to note that the alcohol is used as the thermometric liquid, while the mercury only serves as an indicator. A barogram, produced by a barograph. A barograph is a recording aneroid barometer, which measures barometric pressure. It produces a paper or foil chart called a barogram that records the barometric pressure over time. Barographs use one or more aneroid cells acting through a gear or lever train to drive a recording arm that has at its extreme end either a scribe or a pen. A scribe records on smoked foil while a pen records on paper. The recording material is mounted on a cylindrical drum which is rotated slowly by clockwork. Commonly, the drum makes one revolution per day, per week, or per month and the rotation rate can often be selected by the user. Hygrometers are instruments used for measuring humidity. A simple form of a hygrometer is specifically known as a "psychrometer" and consists of two thermometers, one of which includes a dry bulb and the other of which includes a bulb that is kept wet to measure wet-bulb temperature. Evaporation from the wet bulb lowers the temperature, so that the wet-bulb thermometer usually shows a lower temperature than that of the dry-bulb thermometer, which measures dry-bulb temperature. When the air temperature is below freezing, however, the wet bulb is covered with a thin coating of ice and yet may be warmer than the dry bulb. Relative humidity is computed from the ambient temperature as shown by the dry-bulb thermometer and the difference in temperatures as shown by the wet-bulb and dry-bulb thermometers. Relative humidity can also be determined by locating the intersection of the wet- and dry-bulb temperatures on a psychrometric chart (see below). One device that uses the wet/dry bulb method is the sling psychrometer, where the thermometers are attached to a handle or length of rope and spun around in the air for a few minutes. The simplest type of anemometer is the cup anemometer, invented (1846) by Dr. John Thomas Romney Robinson, of Armagh Observatory. It consisted of four hemispherical cups each mounted on one end of four horizontal arms, which in turn were mounted at equal angles to each other on a vertical shaft. The air flow past the cups in any horizontal direction turned the cups in a manner that was proportional to the wind speed. Therefore counting the turns of the cups over a set time period produced the average wind speed for a wide range of speeds. The three cup anemometer developed by the Canadian John Patterson in 1926 and subsequent cup improvements by Brevoort & Joiner of the USA in 1935 led to a cupwheel design which was linear and had an error of less than 3% up to 60 mph. Patterson found that each cup produced maximum torque when it was at 45 degrees to the wind flow. The three cup anemometer also had a more constant torque and responded more quickly to gusts than the four cup anemometer. 6. Correctly read a daily weather map as published by the National Weather Service, explaining the symbols and telling how predictions are made. A weather map is a tool used to display information quickly showing the analysis of various meteorological quantities at various levels of the atmosphere. Maps utilizing isotherms show temperature gradients, which can help locate weather fronts. Isotach maps, analyzing lines of equal wind speed, on a constant pressure surface of 300 mb or 250 mb show where the jet stream is located. Two-dimensional streamlines based on wind speeds at various levels show areas of convergence and divergence in the wind field, which are helpful in determining the location of features within the wind pattern. A popular type of surface weather map is the surface weather analysis, which plots isobars to depict areas of high pressure and low pressure. Winds have a standard notation when plotted on weather maps. More than a century ago, winds were plotted as arrows, with feathers on just one side depicting five knots of wind, while feathers on both sides depicted 10 knots (19 km/h) of wind. The notation changed to that of half of an arrow, with half of a wind barb indicating five knots, a full barb ten knots, and a pennant flag fifty knots. An isobaric analysis involves the construction of lines of equal mean sea level pressure on a geographic map. The innermost closed lines indicate the positions of relative maxima and minima in the pressure field. The minima are called low pressure areas while the maxima are called high pressure areas. Highs are often shown as H's whereas lows are often shown as L's. Elongated areas of low pressure, or troughs, are sometimes plotted as thick, brown dashed lines down the trough axis. 7. What is meant by relative humidity and dew-point? The amount of water that air can hold depends on the temperature. The hotter it gets, the more water the air can hold. At any given temperature, the air can become so saturated with water that it cannot hold any more. Water will not evaporate under this condition. The ratio of how much water is in the air compared to how much could be in the air is the relative humidity. The relative humidity is 100% when the air can hold no more water. Recall that the air can hold more water when it is warm as compared to when it is cold. Therefore, if the temperature changes while the amount of water in the air remains constant, the humidity will change. As the air warms, the relative humidity will drop. As it cools, the relative humidity will rise. The dew point is the temperature for which the relative humidity will be 100% assuming the amount of water in the air remains unchanged. If the temperature drops below the dew point, the air will no longer be able to hold all the water, so it condenses out in the form of dew or fog. 8. Draw a cross section of the atmosphere, showing its five layers and describe them. The Earth's atmosphere consists, from the top down, of the exosphere, thermosphere, mesosphere, stratosphere, and the troposphere. The exosphere is the uppermost layer of the atmosphere. On Earth, its lower boundary at the edge of the thermosphere is estimated to be 500 km to 1000 km above the Earth's surface, and its upper boundary at about 10,000 km. It is only from the exosphere that atmospheric gases, atoms, and molecules can, to any appreciable extent, escape into space. The main gases within the exosphere are the lightest gases, mainly hydrogen, with some helium, carbon dioxide, and atomic oxygen near the exobase. The exosphere is the last layer before space. The thermosphere is the layer of the Earth's atmosphere directly above the mesosphere and directly below the exosphere. Within this layer, ultraviolet radiation causes ionization. It is the fourth atmospheric layer from earth. The thermosphere begins about 80 km above the earth. At these high altitudes, the residual atmospheric gases sort into strata according to molecular mass. Thermospheric temperatures increase with altitude due to absorption of highly energetic solar radiation by the small amount of residual oxygen still present. Temperatures are highly dependent on solar activity, and can rise to 2,000 °C. Radiation causes the air particles in this layer to become electrically charged, enabling radio waves to bounce off and be received beyond the horizon. The mesosphere is the layer of the Earth's atmosphere that is directly above the stratosphere and directly below the ionosphere. The mesosphere is located from about 50 km to 80–90 km altitude above Earth's surface. Within this layer, temperature decreases with increasing altitude. The main dynamical features in this region are atmospheric tides, internal atmospheric gravity waves (usually just called "gravity waves") and planetary waves. Most of these waves and tides are excited in the troposphere and lower stratosphere and propagate upward to the mesosphere. In the mesosphere, gravity-wave amplitudes can become so large that the waves become unstable and dissipate. This dissipation deposits momentum into the mesosphere and largely drives its global circulation. The stratosphere is the second layer of Earth's atmosphere, just above the troposphere, and below the mesosphere. It is stratified in temperature, with warmer layers higher up and cooler layers farther down. This is in contrast to the troposphere near the Earth's surface, which is cooler higher up and warmer farther down. The border of the troposphere and stratosphere, the tropopause, is marked by where this inversion begins, which in terms of atmospheric thermodynamics is the equilibrium level. The stratosphere is situated between about 10 km (6 miles) and 50 km (31 miles) altitude above the surface at moderate latitudes, while at the poles it starts at about 8 km (5 miles) altitude. The troposphere is the lowest portion of Earth's atmosphere. It contains approximately 75% of the atmosphere's mass and almost all of its water vapor and aerosols. The average depth of the troposphere is about 11 km in the middle latitudes. It is deeper in the tropical regions (up to 20 km) and shallower near the poles (about 7 km in summer, indistinct in winter). This requirement is very similar to one found in the Explorer AY curriculum, except that Explorers are required to keep these records for one month. Note that the month of record keeping neatly meets this requirement as well as the week of record keeping required in the Weather honor. If you forget to take records for a day, do not despair. As long as you have 21 readings, you can count this as three weeks. If you chose to make a rain gauge in the Weather honor, you can use that here. Otherwise, you can find official records online in many places, including The Weather Underground. Enter your zip code, and all the readings needed will be displayed (except for cloud formations). If you decide to build a barometer, you can use official readings to calibrate it. Note the cloud types (Cirrus, Stratus, Cumulus, or Nimbus). Unless you have a registering thermometer or a digital thermometer that records the daily extremes, this will have to come from official records. If you make your own anemometer, be aware that the reading will vary substantially throughout the day. Therefore, you should not be discouraged if your readings and the official readings to not agree. g. Weather forecasts and comparison to what really happened. When you record the day's weather, jot down the forecast as well. The comparisons can be made the next day or at the end of the three week period. 10. Discuss the effect of mankind on weather. Man has a greater impact on the climate than on the weather. The weather is the day-to-day conditions, while the climate covers long term averages. Man's production of greenhouse gases (such as carbon dioxide) has had and is having an effect on the global climate. These changes affect rainfall (increases in some areas, decreases in others) and the severity of storms. Note too that the temperature in the city is invariably warmer than the temperature in the outlying areas. This is mostly because of pavement which readily absorbs heat during the day and then releases it during the night. Dams create reservoirs which facilitate more evaporation than if the river were allowed to flow naturally. This increases both humidity as well as rainfall. This page was last edited on 31 July 2017, at 00:46.